Set of eight (8) bearings with integral flanged half-spacers and black silicon nitride ceramic balls. 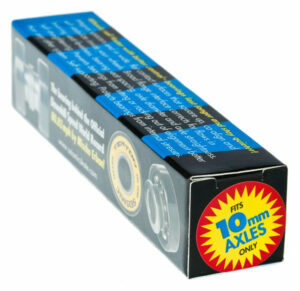 FITS 10MM AXLES ONLY. Wheel Bearings – Tekton 10mm Ceramic – Set of 8. The bearing behind the Official IGSA Downhill Speed World Record – 80.83 mph by Mischo Erban! 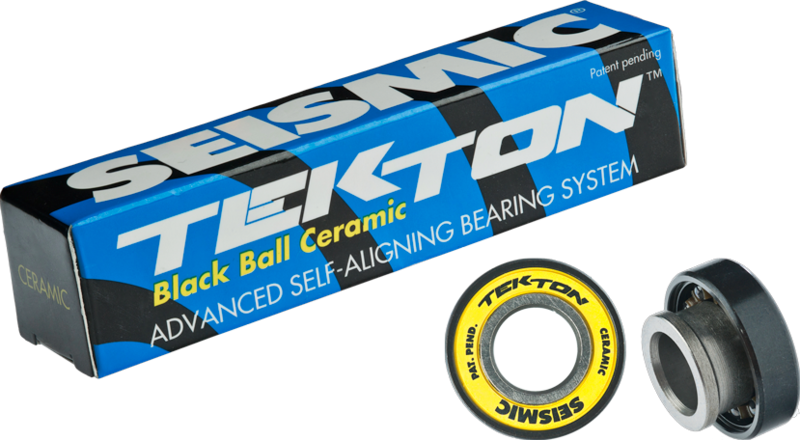 Seismic Tekton bearings feature wide, flat contact surfaces at the ends of integrated, custom-machined half-spacers. The broad flanges square up, co-align, and self-stabilize inside your wheels – correcting for flaws in bearing seat levelness, bearing seat spacing, axle diameter, and axle straightness. Other features include: top-quality black trisilicon tetranitride (Si3N4) balls, nylon retainers, black outer casings, removable rubber-coated steel seals with printed graphic, and a proprietary lubricant combining both oil and grease. The inner race is stepped underneath the seal to resist contamination. On the side opposite the flange, the inner race extends 0.5mm to form a thin integrated washer. No bearing spacers or axle washers required.